Using Roller Bearers on a platen press. The original Kelsey roller trucks were not locked to the shaft as on rollers for larger commercial presses. 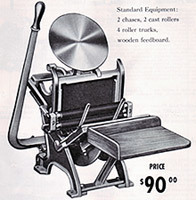 Since these roller trucks were "freewheeling", and would spin independent of the rollers, many small press users run into problems inking their form properly. 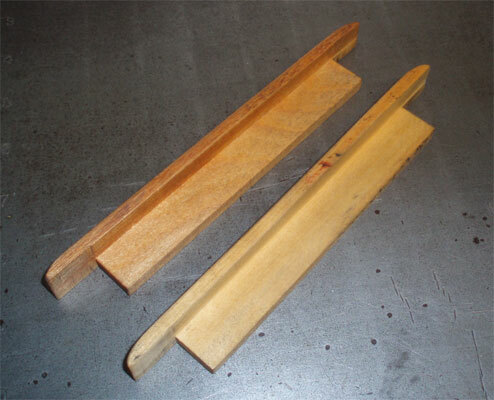 While some replacement roller manufacturers have locking trucks (NA Graphics, Excelsior Parts), many small presses are being used without this advantage. Furthermore, even with locking trucks, there is often insufficient spring tension to "drive" the rollers as they descend the rails and ink the form. The rollers slip and rotate only when they are crossing the form. If you increase your roller spring tension, you may encounter problems opening and closing the press as the rollers navigate the sharp angle between the chase and the ink table. 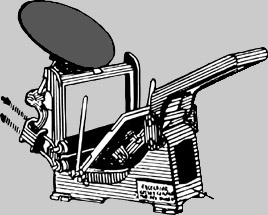 As a result, when you are printing a small form, or if your roller height is not perfectly adjusted, you may run into issues with roller "slur" which occurs as the ink rollers initially hit your form on the downstroke and quite literally smear the ink a bit against the leading edge of your form. This affects your print quality and does not look good. One tried and true solution to this is to use Roller Bearers to support and help keep your ink rollers rolling over the form. 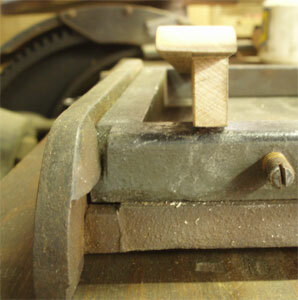 To the right, you can see a pair of roller bearers of the style we manufacture for the Kelsey 5x8 press. These bearers are undercut so that they occupy only 18 points (1/4") on either side of the chase. ($28/set from Excelsior Press) These roller bearers are finished to be exactly .918" - aka "Type High". These next two photos show how to install undercut bearers in a Kelsey 5x8 chase. Note the undercut of the bearing surface. This allows the user to lock up the bearers so that they take up less space in the chase while giving the maximum support to the rollers as they travel down the form. On the left, you can see how they will fit over the edge of the chase. 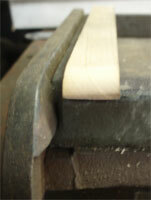 On the right, you can see a bearer properly installed. When you lock up your form, these bearers - made of recycled hard wood furniture - will be held in place as would any other piece of furniture in the form. Other bearers have been used over the years which are simply blocks locked up in the chase. Two disadvantages of this alternate design - especially on small presses - are the width of the rolling surface vs the space they occupy in the chase, and the fact that without the top and bottom undercut, they are contacted by the rollers only after they've reached the form. With the undercut design, the contact surface is wider, the space lost in the chase is limited to 18-36 points, and, with the top and bottom extensions beyond the inner chase area, the rollers contact the bearers before they reach the chase. This way, they are assured to be rolling when they hit the form, thereby eliminating slur on all but the most poorly adjusted or worn rollers. 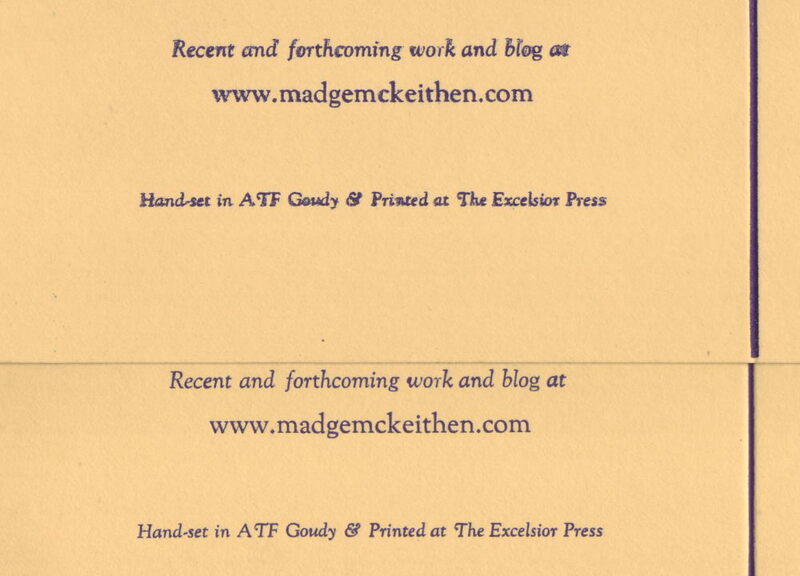 This makes for better quality printing on a smaller - or, for that matter - on any platen press. HOWEVER - There's more to think about: When you are using roller bearers in your chase, you will essentially be printing two large stripes on either side of your form. To protect your printed sheet, we recommend that you build a frisket (see above) to protect your paper from all of this ink..
- Make 100% certain that your gripper fingers and gauge pins are CLEAR of where the roller bearers will strike the form. Otherwise, you will quite likely damage the bearers and be pretty much stuck.... Ignore this warning at your peril! 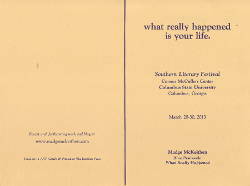 This is the folder that we were printing. The inside was filled with text and it printed with no problem, but when we went to run the outer page - with that little 8, 10 & 12 point blurb on the bottom left, it did not do so well. The upper image is what we were getting without the roller bearers. The lower image is what we got immediately after locking up a set of roller bearers and putting the form back in the press. Click on the image below to see more detail. Other adjustments may have solved this problem, however, time was short; we had to get done quickly and on to another job. The roller bearers solved the problem in a minute; we got the job done, washed up the press and were on to the next job in short order. Sometimes, you may encounter a job in which the background image of an engraving - or polymer base - or your roller rails or roller bearers - pick up some ink and leave unwanted marks on your printed sheet. 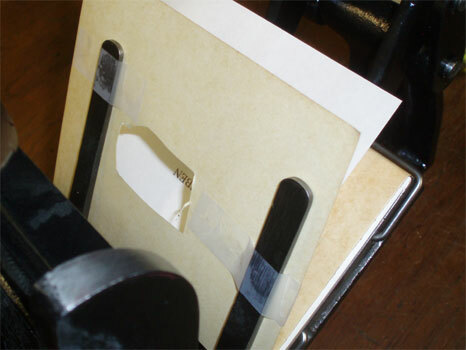 To protect your printed sheet, you can mount a FRISKET onto your press by taping a sheet of packing between the gripper arms, then cutting a hole to let the type print on your sheet.